Guinda “Sam” Carol Crooks-May, left this earth on January 31, 2019. She was born on October 31, 1945 Pikeville, Kentucky to Ermel and Beulah (Bartley) Lawson. They moved to Ohio in 1950 and out to the Streetsboro area around 1959. She worked at Lawson Stores (Circle K) and was assistant manager of Cypress Inn in Rootstown and the Canteen manager at the VFW Post 1055 in Ravenna for years. 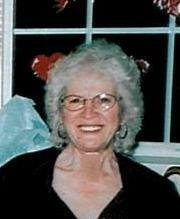 She was an Eagles member and a Moose member for years and Auxiliary member of the Portage County Randolph Fair. She loved to play cards, bingo and camping, loved going to Florida for the winter and just loved people. She is a member of the Unity Freewill Baptist Church of Rockhouse, Kentucky. She would try to go to Kentucky every year to see her family, she said there was something about those hills that never left you and could always feel it in your soul. She is survived by her husband Jim May, her son Jodie Porter of Rootstown, daughter Kimberly Lloyd of Rootstown, adopted daughter Renee Mundell, five grandchildren, five great grandchildren and step children Jim (Barbara) May, Peggy (Jerry) Kline, David (Deanna) May, Barbara (Craig) D’Anniballe, Linda Heffner and Binny May. As well as her best friend of 55 some years Vicky Spriggel of Rootstown, many nieces and nephews and her family in Kentucky. In addition to her parents, she was preceded in death by her first husband Larry W. Crooks, her son Timothy Urdock, her brother Randall Blabe Lawson, sister Karen Kay Lawson and step children Mick May, Gary Heffner and Don Bowsher. At her request, cremation has taken place. A Celebration of life service will be held at 12 PM to 3 PM on Sunday February 17, 2019 at the Ravenna Eagles on Cleveland Road. She will be laid to rest in Homeland Cemetery Rootstown, Ohio. The family asks that in lieu of flowers, memorial contributions may be made to the Portage County Randolph Fair Building Fund PO Box 213 Randolph, Ohio 44265 Condolences and memories of Guinda may be shared with her family at www.sscfuneralhomes.com.